Of the many gaming items I’ve acquired of late, perhaps the oddest is some new dice. No, not the D10s I ordered from Chessex, I’m talking about a pair of perfectly ordinary D6s I was given as a present. 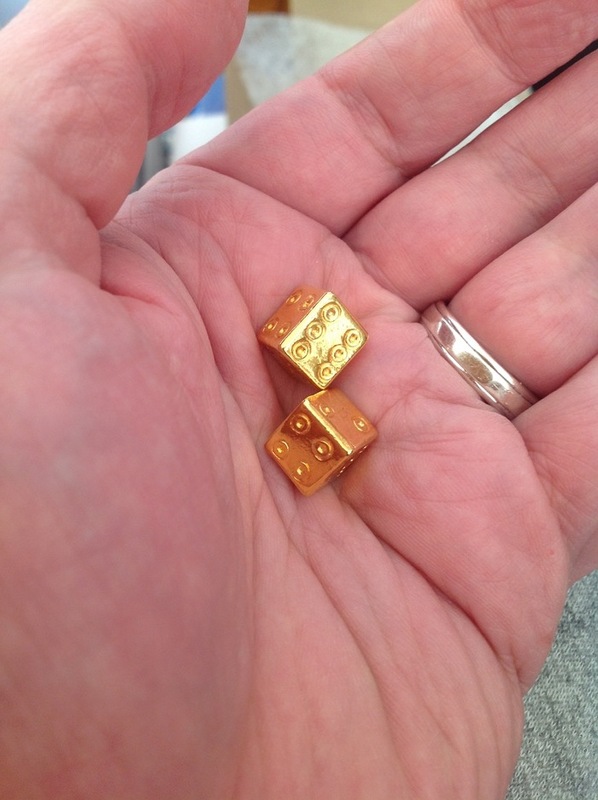 Well, when I say ordinary, I mean 24K gold plated reproduction 1st century Roman dice, so perhaps not entirely run-of-the-mill. Now I’ve got them, I’m not quite sure what to do with them. Those of you that know your dice history will remember that Roman dice are rarely (if ever) entirely accurate cubes. Instead they are often endearingly wonky, as are these. That may rule out using them in anger, so to speak, though I don’t expect that most of my regular opponents would object to them representing heroes, and so on. I’ve no idea whether their wonkiness is a help or a hindrance. Does anyone else have any ostentatious gamer bling? A big bag of custom cut dice is probably the closest I’ve got. And very nice they are too. I’ve got so much gamer bling. Let’s see. I have a set of gold and jeweled D6 I used with my old Space Marine army, The Emperor’s Blingest which I then gave to my brother and he still has to this day. For Mars Attacks, I got double of most of the Martians so my girlfriend can paint them in ultra Kawaii mode with glitter, pastels, and blushing faces. Less bling and more garish. I’m not much of a one for gamer bling. My dice-shaped ear stud is probably the only thing I’ve got that counts. But as for what I’d do with those Roman dice, Jake, that’s easy: I’d turn them into cuff-links. My thoughts exactly. They would make pretty fancy cuff-links and you can still bring up “alia iacta est” in any fancy party conversation.